Located at the bottom of the downtown One Eleven office building hides a magical haven of food and drink. It’s a food hall that you may have heard of: Fareground. If you haven’t, you’re about to, and you may find yourself dining at Austin’s first city food hub. Developed by the ELM Restaurant Group, Fareground is a microcosmic dining utopia situated in the heart of Austin. Its list of vendors includes some of the best restaurant proprietors in the city: Easy Tiger, Antonelli’s Cheese Shop, Emmer and Rye, Contigo, Ni-Kome and Dai Due. Surprisingly, Fareground is Austin’s first gourmet food hall. It opened in late January as the latest product of a long-lasting trend that made upscale gastronomic food halls ubiquitous across the U.S. (See: Union Market in Washington, D.C. or Melrose Market in Seattle, WA). What are the key components of these hip food oases? 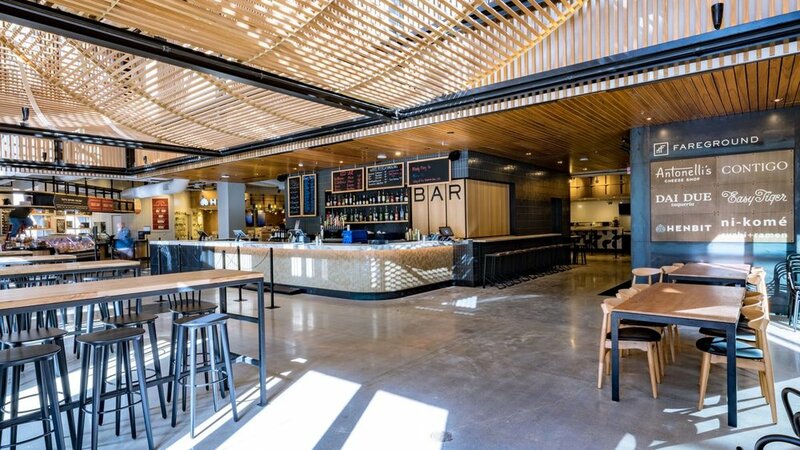 Great natural light, plenty of seating, a variety of vendors and cuisines, all-day hours (meaning breakfast, lunch and dinner), a downtown or “up-and-coming” industrial district location and a fully stocked bar, all of which Fareground boasts. In fact, you could spend an entire day eating at Fareground and not come close to consuming the wealth of goods included in its many menus. ORANGE Magazine presents our dream itinerary as inspiration just for you. The morning begins with a walk down the stairs off 2nd Street that lead into the belly of the operation. Straight ahead is a sleek outdoor seating area. To your right, you see a turf hill with casually-placed Adirondack chairs (which you’ll likely lounge in later), and to your left, the hall itself, encased in a ceiling-high glass wall. As you descend you become aware of the fact that you’re leaving the busy streets of downtown Austin behind for a far more quiet hustle in the intimate, luxe space of the food hall. You enter the building and take in the space: two story ceilings covered with sail-like undulating rafters of ribbed wood that diffuse soft, morning light over the wooden high-tops and picnic tables. As you enter, you are greeted with a prime view of a chic bar with marble countertops, angular minimalistic stools and shelves stocked with liquor. But it’s too early for that, you’ll be back later. First things first, you need coffee from the hall’s resident bakery and coffee shop, Easy Tiger. You keep it simple with a cup of Texas Coffee Traders drip coffee and a pastry, either a cinnamon knot or a tiger claw infused with a spiced pecan filling. However, by 10:30 a.m., you’re hungry again. Pastries are really just a pre-breakfast snack anyway. You venture into the cavernous space behind the bar to investigate other vendors. You hone in on Henbit, the sister restaurant to the nationally-acclaimed Emmer and Rye. Though tempted by their interesting kolache offerings (think cheese, roasted broccoli and Berkshire sausage wrapped in Red Fife wheat dough), you opt for their protein-heavy breakfast bowl instead, featuring crispy short rib, sweet potatoes, pickled chilies, local greens and a poached egg. Not a bad choice at all. It’s about 1:30 p.m. now and when in need of mid-afternoon fuel, that means one thing: tacos. Nestled into the far right corner of the hall is Dai Due Taqueria, headed by chef Jesse Griffiths and co-owner Tamara Mayfield. They teamed up with Gabe Erales who worked under Rene Redzepi at Noma Mexico to create a street-style taqueria with hyperlocal ingredients. They mill Mexican heirloom corn on-site to make masa for their tacos, and heavily feature game meat, such as venison and wild boar, on their menu. That sort of quality doesn’t come cheap. At six dollars a taco, if you don’t notice quality, your wallet will. However, a bite into their wild boar, cooked right there on a trompo spit, infused with grapefruit and enveloped in their addictive, smoky pecan-árbol salsa on a fresh tortilla -- well, suddenly six dollars might not seem like so much after all. The sun is finally beginning its descent, and it’s time for drinks. After seeing your delicious Instagram story about today’s eats, some of your friends decide to join you. You all sit at that chic bar you’ve been eyeing all day. Good news is that the menu looks fantastic. The bad news is that there is currently no happy hour menu. (It is in the works, as is a second bar on street level). But as far as bar prices go, these aren’t too bad: eight dollar cocktails, beers starting at five dollars and eight dollar glasses of wine. You’re tempted by the pineapple mezcal punch, but maybe a glass of wine would be more appropriate since you’re about to order a world-class cheese plate from another vendor, Antonelli’s Cheese Shop. Their various board offerings feature cheeses uncommon to the untrained eye. With the kind of top tier products they offer, getting a board for 10 dollars or is certainly a steal. You also peek at their menu of bowls (think mac n’ cheese, burrata with panzanella, feta herbed salad) and sandwiches (grilled cheeses galore), and remind yourself to come back for lunch tomorrow. Though your glass is empty and the cheese is long gone, you somehow still have room for dinner. You and your friends are deciding between the comforts of Southern cooking, or the ever-appealing sushi and ramen dinner. You all decide the best route is to split and share. At Contigo, one person can order half a rotisserie chicken with a chicken drippings wing sauce and a side of their salad of the day, not to mention a few herbed brioche rolls for good measure. Another person gets their Texas-level burger, cooked to a pink medium-rare perfection, while you head over to Ni-Komé, for a big bowl of miso shredded chicken ramen and a sushi combo plate. Sufficient to say no one leaves this dinner hungry. Just when you think you can’t eat another bite, somebody mentions dessert, and suddenly, it’s like you have a second stomach reserved just for sugary and fatty foods. 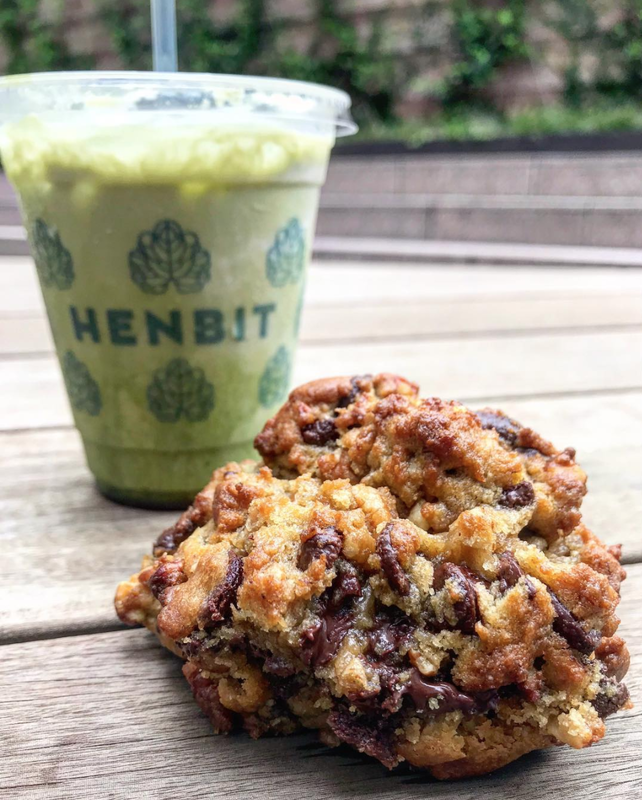 Henbit has something on their menu called a Monster Cookie, priced at four dollars. The Monster Cookie is a cragged mountain of a chocolate chip cookie, with a crisp bronzed shell hiding a delicate gooey underbelly filled with melted chocolate chips and toasted walnut pieces. If that description doesn’t do anything for you, then I’ve failed as a writer. This is arguably the best cookie in Austin. Now that you’ve seen our day of recommendations, it’s time to explore yourself. Whether you need a bite a drink or just a lovely place to hang out in, Fareground will take care of it.